Computer technology has constantly experienced several advances over the decades. With the advent of touchscreen technology penetrating mostly every gadget nowadays, we can’t deny its integration with laptops. Without an ounce of doubt, touchscreen technology has changed the scenery of laptops over the years. They offer more features and convenience for users. This is the case especially for those looking for a tablet to create 3D models or animations. While there are a lot of touchscreen laptops saturating the market, not all of these are built in equal quality. Some offer a good balance of excellent specifications with a good build quality while some are so poorly built they will have you scratching your heads thinking they only exist to grab a hold of your hard earned cash. We don’t want you to waste your money on substandard, poorly functioning laptops. In this article, we will highlight the best touchscreen laptops that you can buy in 2018. What are the Best Touchscreen Laptops of 2018? After scouring the market for products that are worthy to be featured as one of the best touchscreen laptops, we have come up with this list. Read on to know more about each product so that you can find the best touchscreen laptop that best suits your needs. The first entry on our list is the popular 2 in 1 laptop from Microsoft. This laptop deserves to be included in our list because it is equipped with top of the line specs, a gorgeous display and fast processor. 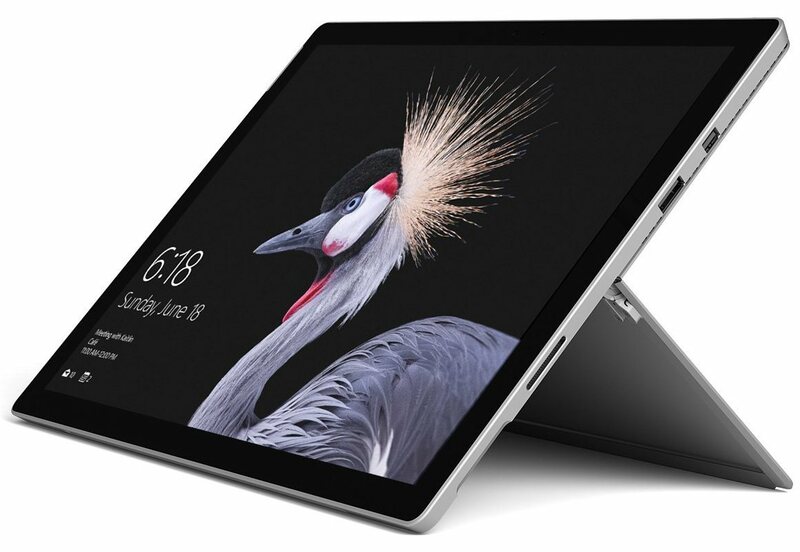 Under the hood, the Microsoft surface pro is powered by a 7th Gen Intel Core m3 processor, there is also a higher-end model which boasts a beastly 7th Gen i5 or i7 processor. This beast of a processor is paired with an Intel HD Graphics 615-620 or an Intel Iris Plus Graphics 640 for the higher end model. With this, expect a fluid and smooth experience with the surface pro. Doing video edits? Programming? 3d animation? The Surface Pro can handle all that without a sweat. Loaded with 4 GB of RAM for the base model and 16 GBs for the higher end model, multitasking with the surface pro is a walk in the park. Another feature the Surface Pro can boast about is its gorgeous display. The screen flaunts a moderately sized 12.3 inch display. With a smaller size, you get more eye candy as the pixels are more compressed. What’s more impressive that it dons a resolution of 2736 x 1824 pixels coupled with PixelSense Technology. Doing graphics design and photoshop is a treat for all users thanks to its gorgeous display. With specifications this advanced, you might think that the screen is bulky. But no, the surface pro flaunts one of the slimmest screens in the laptop world. It also has its own stylus or pen which they call the Surface Pen. The pen allows accurate writing and drawing on the screen with good response. So whether you are an artist or an architect who does designs on a laptop, then the surface pro is a good option. The Microsoft Surface Pro is close to perfection. Finding a downside was a challenge, but if we were to nitpick, it would be the average battery life. With these combination of specs and price, we were hoping to get more juice from the device. However, 5 hours of continuous use from a single charge is not that bad. A Chromebook as one of the best touchscreen laptops? Yes, you heard it right. 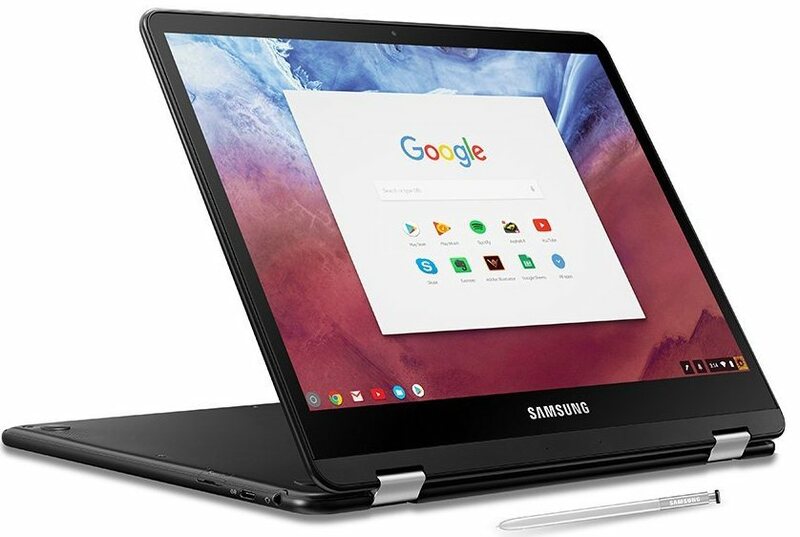 While you may debate that Chromebooks lag in performance compared to hybrid laptops, that is not the case for the Samsung Chromebook Pro. While it definitely does not rank up to the more pricier hybrid laptops in this list, for its price, it offers good value to your money. Under the hood, it is powered by the 7th Gen Intel Core m3 and is coupled with 4 GB of RAM. With this configuration, you can do usual tasks such as encoding, surfing, gaming and basic editing without the annoying hiccups that are common in other Chromebooks. For its graphics card, it is equipped with the impressive Intel HD Graphics 515. We say impressive since this type of graphics card is not usually found in most Chromebooks. LED display which is comparable to the higher end notes and smartphones from Samsung. SO with this, you can expect good color production and excellent viewing angles. Much like the Note Series from Samsung, it is equipped with a stowable stylus which is equally as convenient as efficient. Think of the Samsung Chromebook as a much larger Samsung Note with a faster processor. As with most Chromebooks, the main drawback is the measly storage size. It only has 32GB of storage. With this, you don’t get all the luxury of storing your files especially the large ones. The next entry on our list is one of the latest offering from the company that brought us excellent laptops with capable processing speeds. This time, we will feature the HP Spectre x360. Right of the bat, you will see that the HP Spectre x360 has one of the best designs for a laptop in general. It dons slim bezels, allowing you to indulge in the content from the laptop. It is also very light and portable. Placing it in a slim bag is not an issue. It is equipped with the 8th Generation Intel Core i5 for the base model and i7 for the higher end unit. Paired with this efficient processor is the Intel UHD Graphics 620 graphics card to allow for a more fluid experience. It also has 8 GB of RAM for the base model and 16 GB for the higher end one. This is more than enough to let you do several things at the same time on the laptop. Compared to the ones mentioned before, it dons a larger screen spanning to 13.3 inches. For the base model, it only has a Full HD display (1920 x 1080). However, if you want to get the better looking display, get the higher end model as it has an Ultra HD display (3480 x 2160). The Ultra HD display of the HP Spectre x360 is surely a head turner. Aside from these excellent set of specifications, it has a large storage amounting to 256 GB for the base model and 1 TB for the higher end unit. With this, you need not worry about storing large files. The accessories also excel in quality. It has a responsive touchpad and a keypad that boasts of great tactility and build quality. In terms of battery life, this thing is able to last up to 6 hours on a single charge. 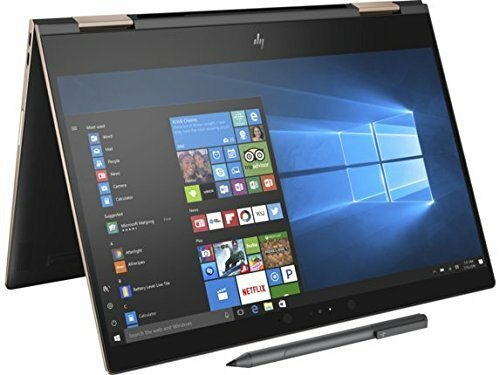 However, in order to get your hands with the HP Spectre x360, you need to shell out more bucks as it comes with a hefty price tag. 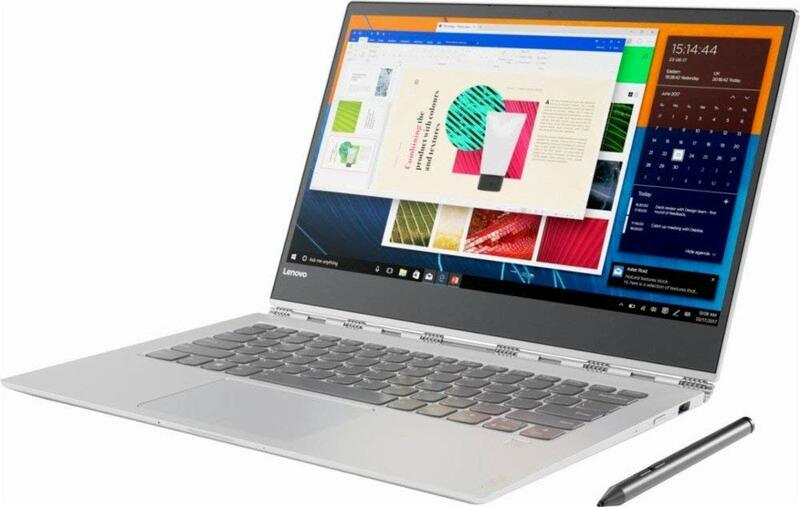 The next entry on our list is the Lenovo Yoga 920. One of the biggest selling point of the Lenovo Yoga 920 is the amount of screen real estate it offers. It has one of the largest displays among the 2 in 1 hybrid laptops available in the market. It has a screen that reaches up to 13.9 inches. It’s also worth noting that the Yoga 920 offers a resolution of 1920 x 1080 for its base model and Ultra HD (3480 x 2160) for its higher-end model. The Yoga 920 is equipped with the 8th Gen Intel Core i5 for its base model and i7 for the higher end unit. Both of these units come with an Intel UHD Graphics 620 card for a more fluid experience. To make things even faster, it comes with 8 GBs of RAM and 16 GBs for the higher end unit. It also comes with 256GB SSD for its storage size. If you want more storage space, go for the higher end unit as it has 1 TB of storage space. One of the things we did not like with the Yoga 920 is its average battery life, although, this is expected because of the larger screen. 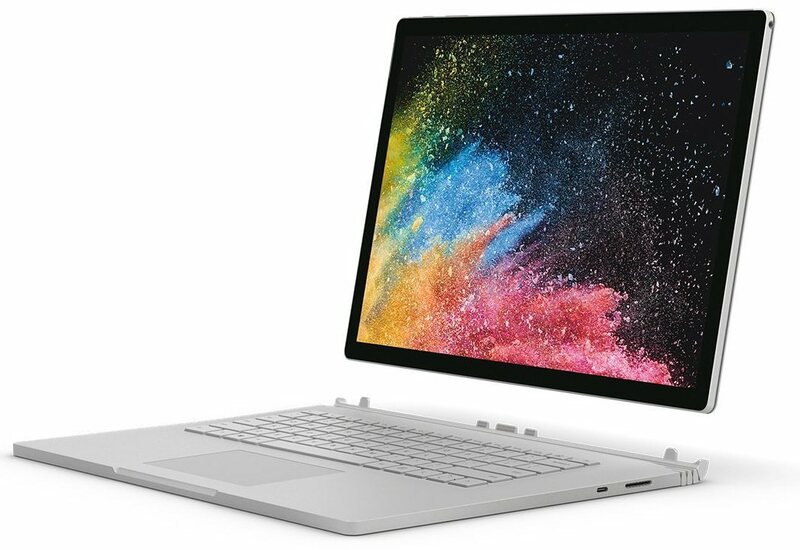 The last but definitely not the least entry on our list is the Microsoft Surface Book 2. If you were impressed about what the Surface Pro offered, you might be aghast with the Surface Book 2. It is much like the Surface Pro but with a better display, a more updated processor and a larger display. Under the hood, it is powered by the massively powerful 8th Generation Intel Core i7 processor. Paired with this is a discrete yet equally powerful Nvidia GeForce GTX1060 (6GB GDDR5) graphics card. With this combination, you can throw in any intense task to the Surface Book 2 and the laptop can run it without breaking a sweat. To make things even faster, it has 16GB of RAM. Speaking about displays, it has one of the largest displays among the hybrid laptops, even larger than the Yoga 920. It has a whopping 15 inch screen, which is more than enough screen real estate to let you enjoy movies or do important tasks such as editing photos or doing 3d designs. It also has a gorgeous looking display with good color reproduction and excellent viewing angles. This is due to the Ultra High Definition display (3420 x 2160). In terms of storage, it also does not hold back as it has a 1TB SSD. With this combination of specifications, it is a no-brainer that this beast of a touchscreen laptop comes with a pretty hefty price tag. So that’s a wrap. Those are the best touchscreen laptop offerings for 2018. We hope we have helped you in your search for the laptop that best suits your needs. Whether you are in for the pricier laptops or the cheaper Chromebook, any of these products will give you unparalleled value for your money compared to the sea of low quality touchscreen laptops abounding the market. What are the Advantages and Disadvantages of Touchscreen Laptops? Much like any type of innovation it has its own set of advantages and disadvantages. If you are used to using the traditional laptop, you might want to think hard whether you want to invest in buying a touchscreen laptop. Here are the advantages and disadvantages of touchscreen laptops. Touchscreen displays allow for a quicker and more intuitive manner of interacting with your computer. Making use of a touch screen makes it easier and faster to use the PC rather than using the usual keyboard and mouse. Pointing to a specific area of the screen is as simple as touching the screen compared to moving the cursor around. Moreover, tapping and swiping on a touch screen display is also more convenient and responds faster since you are interacting on to the screen directly. Using a mouse takes a couple of movements and several other gestures which make it slower and less fluid. There are several touchscreen laptops that are equipped with a pen or a stylus. The stylus offers better precision when interacting with the screen. With this, you are able to write or draw on the screen more accurately. The integration of the pen with Windows 8 and 10 is notably fluid and smart. They offer an excellent translation of handwriting into text. Because of this, simply writing on the screen becomes faster than merely typing using a traditional keyboard. better-looking display with excellent resolution. Since one of the main selling points of touchscreen laptops is their display, they have put an effort to deliver on the promise of a good looking display. One of the biggest advantages of using a touchscreen laptop is the ease in creating content through editing programs. Using a touchscreen display, placing colors and shapes through photoshop is as simple as a simple touch or drag. Imagine all the time you save from constantly scrolling around the display with your mouse. While there are several reasons why you should buy a touchscreen laptop, there are also some disadvantages that you must think about before buying one. Just like other gadgets that employ the use of touchscreen technology, you should expect a lot of smudges on your screen. This is a rather inevitable bane of every touchscreen display. With this at hand, make sure to keep a microfiber cloth close and expect a lot of cleaning, unless you are fine with a screen full of smudges. There’s also what we call “Gorilla arm”. Gorilla arm is a term coined for people who get sore arms after using a touchscreen display for long periods of time. Unlike using a keyboard and mouse, you do not need to raise the screen for long periods. Holding a screen for a long duration will result in sore arms. Because the displays have additional components compared to traditional laptops, they tend to become bulkier and heavier. In fact, if the display has a built-in active digitizer for pen support, then expect it to be relatively thicker and heavier. However, the added thickness is not that apparent and is negligible. The added thickness can range from 1 to 2 mm. So if you want to have a sleeker and slimmer laptop, then you should think twice before buying a touchscreen laptop. Moreover, the added weight might be an issue for some. Touchscreen laptops are also notorious for having shorter battery life. Having a touchscreen display apparently requires more power from the processor. As a result, it also takes up a lot of juice from the battery. Non touch screen laptops have a better life compared to touchscreen laptops. Touchscreen laptops can only last up to 4 or 5 hours in a single charge. So if you are constantly on the move and the possibility of having an electrical outlet close is uncertain, then you might be better off having a traditional laptop. Lastly, touchscreen laptops usually come with a heftier price. They cost more than traditional PCs. The difference can range from $100 to $500 depending on the model. So if you want to buy a touchscreen laptop, prepare to shell out more cash. The question now is, will touchscreen laptops replace traditional laptops in the future, much like how smartphones have taken over keypad phones? Basing on users’ preference today, probably no. Most people still prefer using traditional laptops because they think they are more convenient to use. This is probably because we are more trained to use these laptops and others see touchscreen displays for laptops as sort of a gimmick. However, whether we like it or not, touchscreen laptops will be a part of the constant innovation of computers. More and more manufacturers have invested so much in research and development trying to produce a touchscreen laptop that offers more stability and efficiency. With this at hand, we might see a change in atmosphere when it comes to consumers’ view of touchscreen laptops. Based on the advancement of touchscreen laptops today, we still can say that it is worthwhile to invest in buying one. Indeed, there might be some flaws here and there, but the overall value and convenience they offer are still worth noting.